Let me just give a you and all your staff a big, big THANK YOU! Danni and I had an amazing time and I’m so glad we got to go with the same guide again. Just like on my first trip two years ago, he proved to be perfect for the role. As you promised, the scenery towards Sa Pa is breathtaking and we are glad we chose this route. 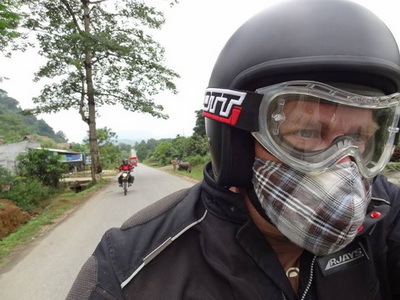 The weather played along and although we encountered rain and fog on our last ride down to Lao Cai, it made for a nice change and experience from the sunshine we had on all the other days. Thank you also for looking after us in Hanoi when we first caught up for our briefing. Danni and I managed to organized a big holiday with trips to Hoi An, Ha Long bay, China, Hong Kong and Kuala Lumpur, but the ride was definitely the pinnacle of it all! We both enjoyed the Minks and I still think they are the bike of choice for Vietnam. You have a great business model and please don’t change a thing, we will be back!... and hopefully not so long between trips this time.